Amazon Select Paints are premium quality, eco-friendly latex paints. They’re manufactured from surplus paint that Amazon collects from government, business, and consumers, and recycles using patented technology. Amazon Select Paint’s reprocessing system guarantees that every gallon sold meets strict specifications for color, gloss, viscosity and coverage. Amazon Select Paint can be used for interior or exterior applications. Amazon Select Paint can be used on drywall, wood, stucco, or masonry. Every paint can donated is opened and inspected to make sure it is usable paint. 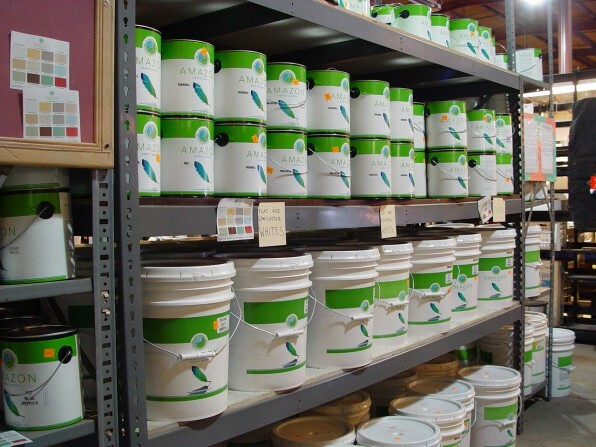 Good quality, reusable paints are hand sorted by color for processing into recycled paint. Amazon Select Paint meets the same specifications as high quality virgin paint sold by the nation’s leading manufacturers. Reusable paints of the same color are pumped into a tank and mixed with a high-speed mixer. The paint is tested for viscosity, color, sheen, coverage, pH and other characteristics. The paint is then adjusted with additives as necessary to meet strict specifications. Finally, the paint is filtered and packaged for sale. Non-reusable paints are manufactured into other products, including Processed Latex Pigment (PLP). PLP is an alternative raw material used in the manufacture of cement, and is made using Amazon’s patented processes. By using Amazon recycled content paint, you are helping to protect the environment. Replacing new paint with recycled paint saves resources that would have been used in making the new paint. The energy used to make and transport the paint, as well as the minerals, chemicals and pigments that are needed to make new paint are all saved when recycled paint replaces virgin paint. Wastes associated with the manufacture of new paint are avoided. Finally, by using recycled content paint, you are preventing that paint material from ending up in a landfill or, worse, down a drain. Using recycled content paint saves resources, saves energy, reduces pollution, and reduces landfill waste. Use of Amazon Select Paint qualifies for LEED credits because the paint contains over 80% post-consumer content material. Amazon Select Paint is also Green Seal certified. VOC stands for volatile organic compound. VOCs are chemicals that evaporate as the paint dries and they can cause nose, throat and eye irritation, especially in poorly ventilated areas. The EPA currently limits the amount of VOCs in paint to 250 grams per liter. Some paint manufacturers currently sell low or no VOC paint. However, there is currently no regulatory definition of what low VOC means. Some “low VOC” paint may be under 50 grams per liter, while others may be as high as 150 grams per liter. Green Seal, a recognized leader in certifying environmentally preferable products, defines low VOC paint as under 50 grams per liter for interior flat paint, and 100 grams per liter for exterior flat paint. Amazon Select interior/exterior paints are below 150 grams per liter, which is well below the federal limits, but not so low as to be considered “low VOC” by Green Seal. 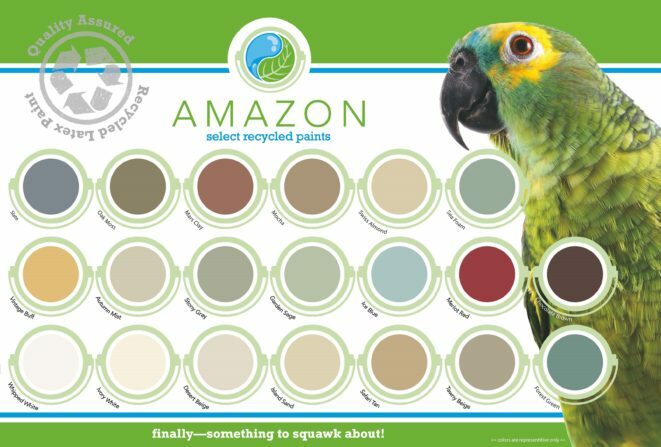 From an environmental perspective, Amazon’s recycled content paint is environmentally preferable to low or no VOC paint. This is because over 90% of the material used in Amazon’s paint has already been made into paint. Very few additional resources or energy must be used to take leftover paint feedstock and reprocess it into high quality paint. By contrast, numerous raw materials are required to manufacture a gallon of “virgin” low/no VOC paint. In other words, the act of manufacturing a gallon of virgin paint will use far more resources and energy than making a gallon of Amazon’s recycled content paint. Amazon Select Paint comes in 18 different colors in a flat finish. Available in 1 and 5 gallon sizes. The white paint colors, Whipped White and Ivory White both come in low-luster. Primer is available in white only. Amazon paint may be used on interior or exterior surfaces. Amazon’s recycled content paint is priced significantly below what you would pay for a similar quality ‘virgin’ paint. It is a great value! Amazon paint is periodically tested by the paint industry’s premier independent organization. Amazon paint meets or exceeds the same quality standards as name-brand, national paints. Every batch of paint is tested by Amazon to ensure that the paint meets a strict set of specifications. In short, you can be confident that Amazon paint is every bit as good as the more expensive, ‘virgin’ paint sold in the big box stores. Community Forklift is the only store in the Washington, DC metropolitan area that sells Amazon Select Paint. 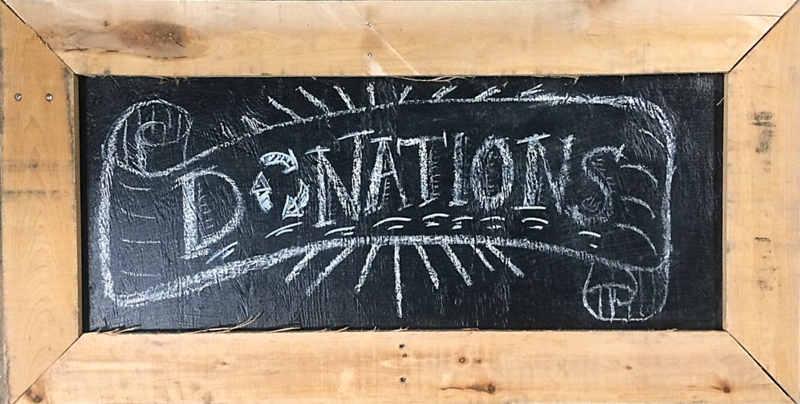 This product line supports our mission of reuse- bringing green building materials to the community at affordable prices, helping us to lift up our local economy and our local community, one 2×4 at a time.